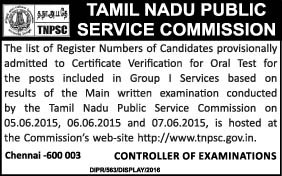 TNPSC Group-I Main Examination Result Declared: TNPSC Group-I Main Examination was conducted on 05, 06, 07 June 2015. TNPSC yesterday declared Group I Main Examination. Oral Test will be conducted on 04.07.2016 and 05.07.2016.